"King of the Southern Barbarians 南蛮王 (nán mán wáng)"
After the Kingdom of Shu Han 蜀汉 had been established in the west for several years, Meng Huo invaded Shu Han from the south. By this time, Liu Bei 刘备 had died and Zhuge Liang 诸葛亮 made all the major decisions as Prime Minister. Meng Huo sarcastically commented that the occupation of Shu Han over the western lands was a barbaric act, thus Meng Huo was going to claim back the land where their ancestors roamed. Zhuge Liang decided that an all-out war would exhaust supplies as well as cause too many innocent casualties. 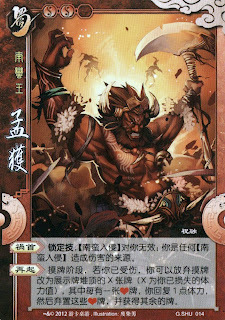 He also predicted that even if Shu Han was victorious, the barbarians would retaliate or harbour thoughts of revenge, thus it was best that Meng Huo and his people can be subdued by winning their respect. Meng Huo attacked Shu Han on different occasions but Zhuge Liang outsmarted him every single time, capturing Meng Huo but freeing him. Every time Meng Huo blamed external circumstances for his defeat and refused to acknowledge Zhu Ge Liang was the stronger. In the end, Zhuge Liang captured Meng Huo 7 times before Meng Huo finally gave in and subdued his people. From then on, the barbarians never invaded Shu Han again and were loyal to Zhuge Liang. BARBARIANS 南蛮入侵 has no effect on you. You are the source of damage caused by BARBARIANS 南蛮入侵. Character ability 2: "Arise Again 再起 (zài qǐ)"
During your drawing phase, if you are not at full health, you can forfeit drawing cards from the deck; instead, you display X cards from the top of the deck (X being the units of health you have lost thus far). For every card with hearts suit displayed, you regain 1 unit of health, then you discard those cards and acquire the remaining cards. Meng Huo's abilities have direct links to the story. He is the King of the Barbarians, therefore it is no surprise that his is "the smoking gun" for any damage caused by BARBARIANS. "Arise Again" probably has links to being released by Zhuge Liang 7 times. Meng Huo had the "never say die" attitude that pushed him to attack Shu Han repeatedly, despite so many failed attempts.